Our dogs are a very important part of our lives. Despite running a busy veterinary practice, our dogs' mental and physical well being is of utmost importance. Our dogs have 50+ acres of grass, woods, and a pond to play in. Daily romps outdoors are followed by nights spent jockeying for best position on or next to the couch! As we know, Aussies thrive on time spent with their people! 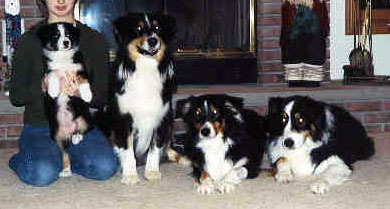 Our dogs are our family, and any pups produced remain "part of us" forever. Here at Silver Screen we are proud of ALL the dogs we have produced. Check out the the next few pages for a sample of just some of them. is expressly prohibited without written permission.